By studying the design of the Meteor Prison Core, the clever Trapsmiths of Queso Canyon were able to create their own version of this fantastical device. Redesigned, reinforced and really, really hot! If you thought prison couldn't get any worse, just turn the temperature up... a couple hundred degrees! This Prison Core takes things to a whole new level. Using Unstable Ember Gadgets to cycle heat, it makes working with hot temperatures a cool breeze! Works just like an air conditioner to remove just enough heat, keeping the temperature in the safe spot between incarceration and incineration. On the bright side, any mice who end up in here end up with one heck of a tan! 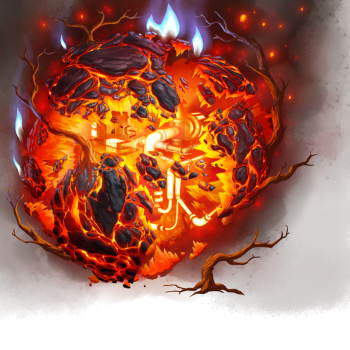 The Ember Prison Core Trap can be purchased from the Queso River Trapsmith, Prickly Plains Trapsmith or Cantera Quarry Trapsmith in exchange for 1,500,000 gold,15 Unstable Ember Gadgets, 8 Ember Roots,8 Ember Stones and 5,000 Nachore and 1 Meteor Prison Core Trap. A complete list of all Law weapons can be found here. 26 June 2018: Ember Prison Core Trap was released with the introduction of Queso Canyon.